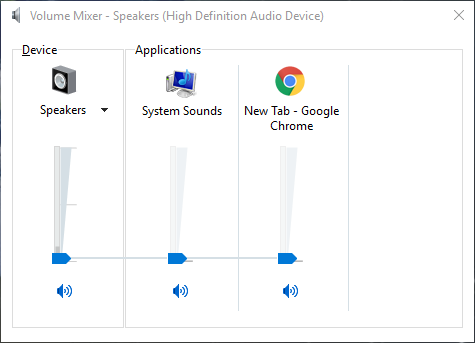 I'm having really poor volume control in windows 10 and I don't know what I can do to improve it. Either somehow changing the settings, or perhaps a software. Basically what is happening is that I'm always setting the volume to 1-3% and on rare occasions up to 5% simply because it's too loud. I wish it would go from 1 to 10 000 instead with 5000 being normal. Please open Device Manager and find out your audio adapter, then right-click it and select Update Driver Software, system will automatically update audio driver. After this, reboot computer to check again. If no help, you need to visit manufacturer website to check if there is any audio device specific program, if there is, download and install it. Not the answer you're looking for? Browse other questions tagged windows windows-10 system-sounds or ask your own question. Visual Studio 2015 not building when I click start?